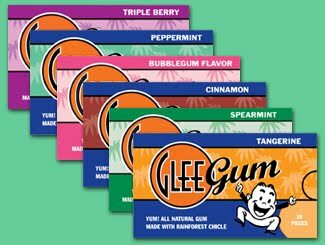 Glee Gum is also gluten, dairy, soy and nut free. It is the only gum made the old fashioned way, with chicle, and it is made in the US (Rhode Island). I received an assortment of Glee Gum that contained all the various flavors of gum. The flavors are Tangerine, Triple Berry, Peppermint, Cinnamon, Bubblegum and Spearmint My favorite was the Tangerine. It has a really great flavor (it was my Hubby’s favorite too)! The gum does not taste like it is healthy or lacking sugar like you might expect from an all natural gum. It is yummy! I also love the packaging and the cute little character, the Glee Guy on the front. Glee Gum is a fun gum that is great for adults or kids. I think it would particularly be good for kids since it comes in little square pieces that fit perfectly in a Childs fingers. It also comes in fun and kid friendly flavors. What is my suggestion for kids? The mixed box (the Wee Glee)! When I was younger I used to love mixing flavors and seeing what different things would taste like together. This is an easy, healthy way to do that! Even better for kids, Glee has “Make Your Own” kits. I admit that I was tempted to request one of these kits! They have a make your own chewing gum kit, gummy candy kit and chocolate kit. All ingredients are included in these kits and they even come with stories. For example, the chocolate kit comes with a story about the origin and development of chocolate from Mayan to modern times. Cool! Visit Glee and let me know which product you would love to try. I'd like to try the triple berry glee gum or the make your own gummies kit. I wouldn't usually go with tangerine but since you like it so much, I thin I'd like to try it! I am a fan of Glee Gum on FB - Lydia Ale. I am your fan on FB - Lydia Ale. I follow via GFC - Lydia A.
I would love to try the Mini Glee Variety Pack. Tangerine Gum sounds great!!! I would love to try that!!! I like the mini glee variety pack. I'd want to try out the chocolate gummies. I would also like to try the Chewing Gum Kit. Tangerine glee gum is one i would love to try especially summer time. I'd like to try the tangerine flavor. 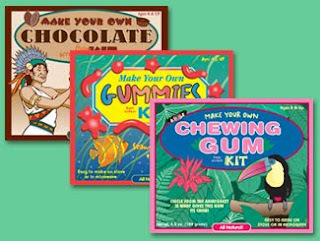 My kids would love the make your own chewing gum kit!